When you become a Telstra customer, we allocate you a specific date of the month when your billing period starts. If, for example, we start your billing period on the 6th of each month, you will be charged from the 6th of that month to the 5th of the next month. This billing period won’t ever change, even if you take up a new plan or service. ‘Bill Issued’ simply refers to the date we issued the bill to you. It’s not the end of your monthly billing period, and it’s not the Due Date to pay your bill. Your Bill Due date is on the first page of your bill. We allow you approximately 14 days from the bill issue date to pay your bill. What charges and payments show up in a typical billing period? Any payments you made towards your previous (May) invoice – provided they landed in our system by 5 June. 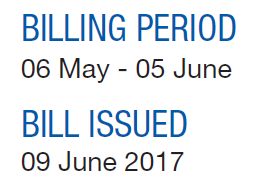 For example, if you paid your May bill on 4 June and the payment hadn't landed in our billing system by 5 June, then your payment wouldn’t appear on the June bill. A Part Month Charge (also called a Pro Rata Charge) appears on your bill when you start a new plan or service part way through your billing period. It covers the days you used your service before your next monthly billing period starts. This is so you only get billed at the new rate for days you used your service, not for the whole month. What if I cancel my service or change my plan? If you decide to cancel or change your services, you will be credited any unused days remaining in that particular billing period.